The dominant liberal narrative concludes that the wealthy only stand to get richer under President-elect Donald Trump’s tax plan. There is, however, a group of wealthy Americans who could legitimately wind up paying more in taxes under Trump than in recent years. Outlets from The Washington Post to Vox to The Atlantic ran stories decrying the president-elect’s plan once Trump released his tax proposal last summer. A closer look reveals they may have missed a few things. Taxpayers whose taxable income falls into one of these two categories will likely pay more in taxes once Trump takes office, Market Watch reports. For individual filers, this would mean income levels between $112,500 and $190,150. For joint or married filers, this would be between $225,000 and $231,450. 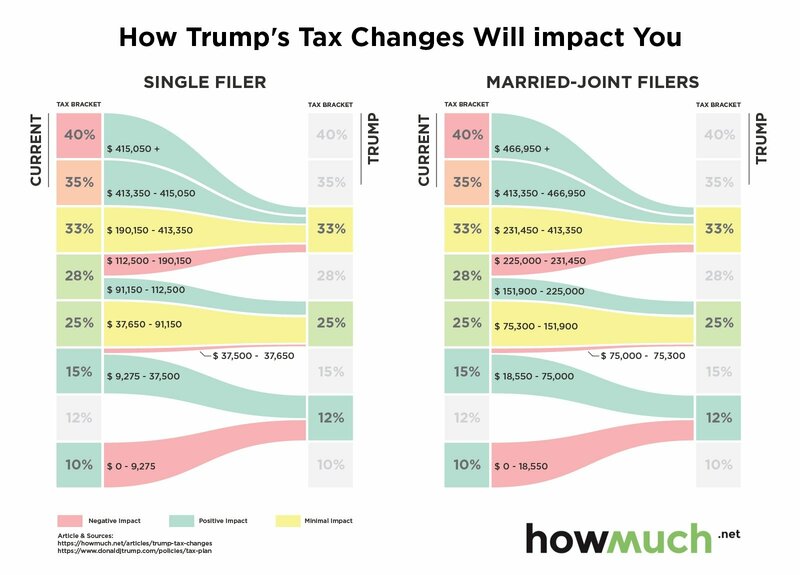 Americans who earn in those ranges will see their marginal tax rate increase from its current level of 28 percent to 33 percent under Trump’s plan, according to analysis by The Tax Foundation. For a single filer making $190,150, this would mean an extra $3,000 in taxes a year. Joint filers should also expect a similar increase in their tax payments. While some might claim that individuals who earn in these ranges are not wealthy, a cursory glance at the median income level for American households may change their tune. The median household income in the U.S. is just over $55,000, according to the U.S. Census Bureau. The figure shows the niche group of wealthy taxpayers in the upper brackets that would likely get hurt. Single filers making between between $112,500 and $190,150, and joint filers earning between $225,000 and $231,450 end up getting squeezed into higher tax brackets. While this would only be around 2 percent of Americans, it surely works to wither some of the arguments that the wealthy are making out. The outcry is not completely unfounded though. The Tax Foundation estimates Trump’s plan could cost as much as $6 trillion in federal revenue over the next decade. Experts say that one of two things will happen if Trump’s plan is enacted as it currently reads. Either the deficit “will go up tremendously or Congress would need to find a significant area of federal spending to cut. Of course, the majority of federal spending is on Social Security, Medicare, other health programs, and defense. So if the Trump plan were enacted in full and Congress didn’t want the deficit to go up, they would almost certainly have to cut from one of those areas,” Scott Greenberg, analyst with The Tax Foundation, tells The Daily Caller News Foundation.